Reach the summit of Kilimanjaro trekking the Lemosho route and benefit from extended acclimatisation on the mountain. We feel we can trust and rely on MK. You use excellent local guides and hotels. Climbing Kilimanjaro was a personal goal. On reaching the summit we were rewarded with fantastic views and a great sense of achievement. A brilliant holiday, ran very smoothly. Our leader was excellent in every way and I would recommend him without hesitation. When you stand on top of Kilimanjaro, you stand on the highest point on the African Continent. It is an extraordinary feeling to be walking on snow and ice, surrounded by huge glaciers, knowing that nearly 20,000 feet below are the hot, dusty plains of Tanzania. Kilimanjaro is a mountain with relatively easy access – it even has its own international airport; therefore the temptation for many people is to try to fit the ascent into a one week holiday which can lead to inadequate acclimatisation. We have carefully researched the best way to increase your chances of succeeding on Kilimanjaro and offer two distinctive trips. Our Summits of Kilimanjaro & Meru trek (see separate itinerary) combines an initial trek up Tanzania’s second highest peak, Mount Meru, 4,562m/15,054ft, with a trek following the Lemosho Route to the summit of Kilimanjaro itself. The ascent of Meru provides invaluable acclimatisation prior to tackling Kilimanjaro. This shorter Kilimanjaro Ascent trip, actually spends more time on the slopes of Kilimanjaro and still offers very good acclimatisation, giving the best chance of making it to the highest point on the African Continent. Whereas many operators expect to reach the summit on the fifth day on the mountain, we take a fairly leisurely ascent via the unspoilt, less trekked and scenic Lemosho Route which gives us a full six nights on the mountain before the final summit push on the seventh day. This longer climbing time gives a greater chance of reaching the top with fewer problems. The Lemosho Route climbs through beautiful, peaceful forest to reach the Shira Plateau, before walking around and gradually up the lower slopes of Kilimanjaro to the high camp at Barafu. From here your final ascent will start in the early hours of the morning, and it is a long, steady climb to the crater rim at Stella Point at 5,752m/18,871ft. Once you have reached Stella Point, the gradient becomes easier for the walk up to the summit, Uhuru Peak. Standing at 5,895m/19,340ft, watching the sun rise over the African plains, as the icy glaciers and peaks of Kilimanjaro gradually come into view, is a tremendous thrill and one that will stay with you for a long time. If you travel on our February 2020 departure you will also get to experience an ascent by the light of the full moon. You may have heard that there are national park fees to pay for climbing Kilimanjaro. Please note that these are included in your trek price and there are no extras to pay on entering the national park. You will also receive a certificate to prove your summit success. Meal arrangements: 9 Breakfasts, 9 Lunches and 9 Dinners. (Depending on flight arrival time, lunch may also be included on day 2). (This is the itinerary for our 05 September 2019 departure. A detailed itinerary for all other dates can be downloaded below). Fly to Kilimanjaro Airport and transfer to hotel. Drive to Londrossi gate, Kilimanjaro’s Lemosho Route starting point. Trek to Mukuba/Big Tree Camp. Trek to Shira 1 Plateau and on to Shira 2 Camp. Trek to Great Barranco Valley, Karanga Camp and on to Barafu Camp. Climb via Stella Point to reach the summit of Kilimanjaro, 5,895m/19,340ft. Descend to Millenium Camp. Trek to Mweka Park Gate. Drive to hotel. At leisure. Transfer to Kilimanjaro Airport and fly to London. Our Tanzania trips are led by experienced, English-speaking local guides. 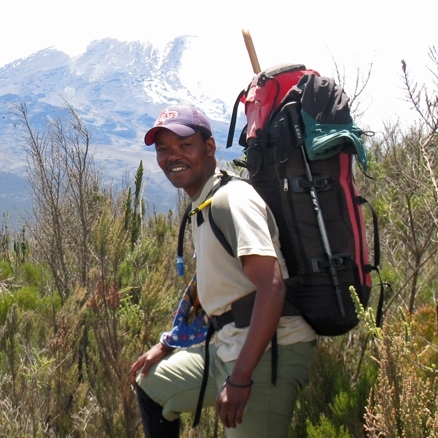 In addition, whilst on Mount Meru you will also be accompanied by an armed national park ranger. Today you fly from London to Kilimanjaro International Airport. On arrival you will be transferred to your comfortable hotel which is situated just 30 minutes from the airport in the foothills of Mount Kilimanjaro. You will have time for a dip in the hotel's pool or just to relax and enjoy the views of the mountain you will soon be climbing. Day 2 - Drive to Londrossi gate, Kilimanjaro's Lemosho Route starting point. Trek to Mukuba/Big Tree Camp, 2,650m/8,694ft - 3-4 hours. You will be picked up this morning for the 3 hour drive to the Londorossi Gate. The gate is set right on the edge of beautiful forest and it is here that you will meet your trek crew and porters. After signing the book it is a short drive up a muddy track, past fields of potatoes and carrots, to the start of the trek. The path sets off climbing gradually through thick forest, full of birds and black and white Colobus monkey and the more common blue monkeys. It is a 3-4 hour walk to tonight's campsite at Big Tree Camp (aka Mti Mkubwa). Day 3 - Trek to Shira 1 Plateau, 3,480m/11,417ft - 5 hours. Today you set off through thick forest on a narrow trail, with the trail undulating and eventually reaching the bottom of a ridge. The vegetation gradually changes as you ascend up the shoulder of a hill, the big trees are left behind and the vegetation becomes like moorland as you reach the Shira Plateau, a vast rock strewn area. Ahead will be the first views of the snow covered peak of Kibo. Day 4 - Trek to Shira 2 Camp, 3,840m/12,598ft - 4 hours. Acclimatisation trek towards Lava Tower Camp. There are a variety of routes that you can take today to reach the next campsite. All are designed to maximise your acclimatisation. The route chosen will be at the discretion of your guide. After around 3 to 4 hours of trekking you will reach the campsite at Shira 2 - one of the best places for views of Mount Meru if the weather is clear. After lunch at camp and a couple of hours of rest, you will complete an acclimatisation hike towards Lava Tower camp giving an additional 200m of ascent today. Day 5 - Trek to Great Barranco Valley, 3,985m/13,074ft - 5 hours. The route to the Great Barranco Valley is via the Lava Tower. It is a steady walk uphill, around huge lava blocks and through sparse vegetation to reach the Lava Tower 4,640m/15,223ft, a huge block on the end of a cliff. There is a cold and windswept campsite here, but you will just have a lunch stop before descending to the Great Barranco Valley. The valley is a lovely spot, with giant lobelia and senecio and the magnificent views of the Heim Glacier, Kili's southern face and the Western breach. You will also be able to view your route up the Great Barranco wall tomorrow. Day 6 - Trek to Karanga Camp, 4,040m/13,254ft - 4-5 hours. Acclimatisation walk. The start of today's trek is one of the most exciting, as you ascend the Barranco wall. This is an easy scramble, and at the top you are rewarded with views of your route ahead and the Southern Ice-fields. You descend from the wall and then climb once more, on the south-eastern flank of Kibo to reach Karanga Camp in time for lunch. This afternoon you will take a short hike out and back from the camp in order to aid acclimatisation. Day 7 - Trek to Barafu Camp, 4,681m/15,357ft - 4-5 hours. Acclimatisation hike. From Karanga, the path leads upwards across volcanic scree, which you follow to reach the Barafu campsite by mid-afternoon. After some time to rest and recuperate there is a further acclimatisation hike towards the intermediate Kosovo Summit Camp, 4,800m/15/748ft, before returning to Barafu. Day 8 - Ascend Kilimanjaro, via Stella Point, 5,895m/19,340ft - 7-8 hours. Descend to Millennium Camp, 3,820m/12,533ft - 2-4 hours. You will set off at about midnight in order to hopefully reach the crater rim for sunrise. The path climbs gradually before reaching a steeper section and then well-graded and seemingly unending zigzags up the main face. Your guide will advise you to walk very slowly and, if you do so, you greatly increase your chances of reaching your goal. Reaching the crater rim at Stella Point is a huge achievement and it is a great relief to know that the hardest part of the climb is now over. The final gradual trek from Stella Point to the Uhuru Summit takes about 45 minutes. The effort for this final push is well rewarded, with superb 360º views of the Southern Ice-field, the Ice Cathedral, the Northern Ice-field and down into the crater and ash pit. It is well worth staying on the summit for as long as you can, before starting the descent. The walk back down the scree to the campsite is relatively quick, and you can marvel at what you have climbed a few hours previously. After a rest and lunch at Barafu, you descend for a further two hours to reach Millennium Camp at 3,820m/12,533ft. Day 9 - Trek to Mweka Park Gate, 1,640m/5,381ft - 4-5 hours. Drive to hotel. Your final day on trek is down a well-maintained path, with the vegetation becoming gradually more extensive, with big trees appearing for the first time since you approached the Shira Plateau on Day 4. The forest is full of tree ferns, impatiens and monkeys. After a 3-4 hour walk you reach the Mweka Park Gate at 1,640m/5,381ft and say a sad farewell to your trek crew and porters. A vehicle will meet you to drive you to your hotel and a welcome shower. Day 10 - At leisure. Group transfer to Kilimanjaro Airport. Fly to London. The morning is free for you to relax in your hotel before transferring to the airport for your afternoon flight back to London. Day 11 - Arrive UK. Today you will arrive back in London. Both Altezza and the safari company were very professional and gave us wonderful service. The guides and porters were a pleasure to be with and gave us good insight of life in Tanzania as well as detailed info about Kili. Thank you Steve and Mountain Kingdoms for organising the trip for us, it all ran very smoothly. A very well organised trip. We loved the small group, three of us plus one other, we got on well and moved at a similar pace. Climbing Kilimanjaro was a fantastic experience, the guides were supportive, friendly and organised everything perfectly. Summiting Kilimanjaro is a memory that I and my fellow trekkers will cherish for a long time to come. The holiday ran like clockwork. The add on safari and Zanzibar was outstanding. You did us proud. We appreciated this. This was excellent in every respect, from accommodation to the guides knowledge and friendliness. I loved the group experience, being with and trekking with other people. We had 11 on our trek - just the right number. It was constantly interesting and entertaining. I loved the camping (without having to think about it). If the view from the summit of Kilimanjaro was not reward enough for your efforts, combine your trek some relaxation time on a thrilling wildlife safari and then chill out on the spice island of Zanzibar.